All through the month of February, I had this idea stuck in my head: The Suffering of Things, or The Sorrows of Things. Not the suffering or sorrow of people or of animals, or even of the insensate entities like trees, but of inanimate objects. There is something here, I think, that’s an important symbol of shared consciousness. Exploring this idea seems a portal into a creative place, so I’m trying to track it down. If we’re going to write about the emotional landscape of humans, it’s important to understand what else – who else – occupies that ground. When we were young children, we loved certain things so much that they became Real to us in a way that meant something different than merely existent. There were certain toys that became playmates and not just playthings, and which comforted us in a world we were growing to understand. And for many of us who are perhaps more sensitive or sentimental, or in need of such comforting, that tendency has persisted into adulthood. My ordeal began about the 1st of February. While drinking my morning coffee, I stumbled over a passage from the children’s book The Velveteen Rabbit by Margery Williams. Do you know the story? There’s a good summary on Wikipedia. And you can read the entire text online for free. Essentially, it’s the heartbreaking story of a little boy (unnamed, just called the Boy) who loves his stuffed rabbit, and the toy rabbit who just wants to be loved. It ends sadly, though I suppose that’s subjective. 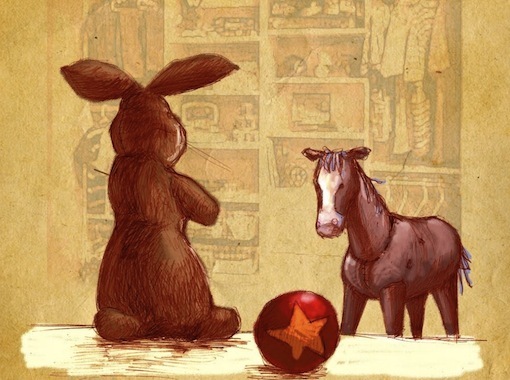 In this passage, the rabbit asks an older and wiser toy what it takes to be Real, to be loved. 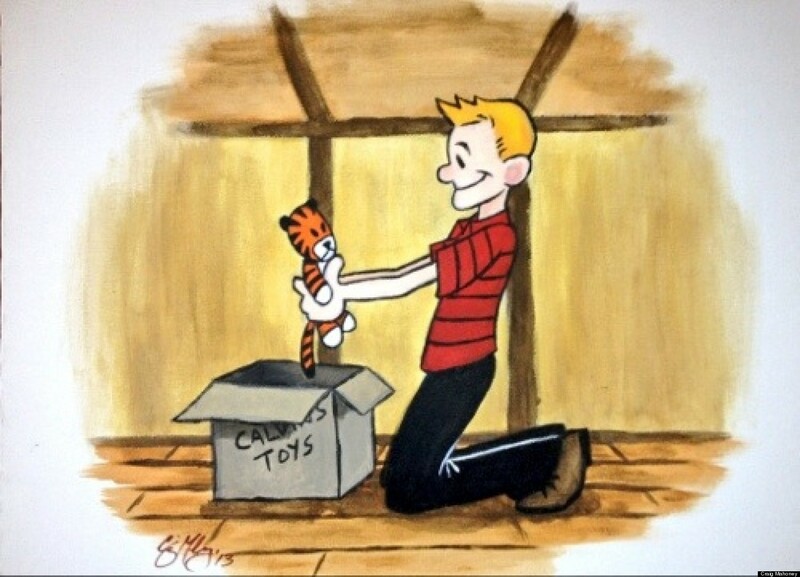 The rabbit story reminds me of a favorite comic of mine, Calvin and Hobbes, about a boy and his stuffed tiger. When they are alone, the tiger is Real. When anyone else is present, Hobbes looks like a toy. I thought about these relationships for a long time. And what the Boy and Calvin don’t know – but what the Rabbit and the tiger Hobbes almost certainly know – is that Calvin and the Boy are doomed to grow up anyway. And then what? What magic remains from the childhood world, for those of us now grown up, pondering death and taxes? Are there some things that we love so much that our love changes them? Does our love for them change us? Do these things suffer, hope, or somehow love us back? If all of the above or none of the above is true, does it matter? Of course it matters. I write fiction and poetry. I use metaphors – symbols. The world I inhabit, if not understand, is made as much of spirit and emotion as of earth and sky. I think I see. For the child, it’s about imagination and play, and security. For the adult, it’s about memory and love. When I see the quilt my grandmother made for me, I still feel her love. When I wind the clock that my grandpa wound, I remember our bond. That was the easy part. The next step is: do some of these things have feelings? Can they suffer? Are they Real? The second part of my pondering ordeal arrived about a week into February. My bother called to say that his pickup truck, which used to belong to me, was dead. 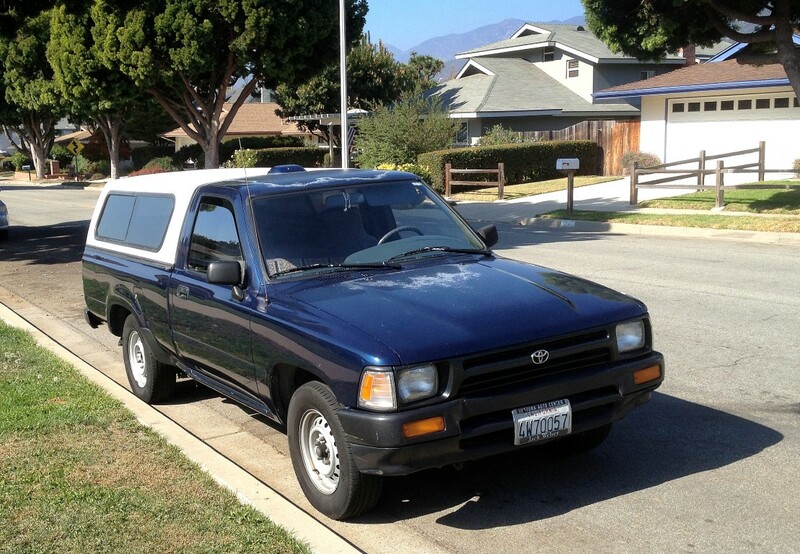 He was kind in telling me, knowing that I was sentimental about the truck we called Old Blue. I drove it for almost 18 years. 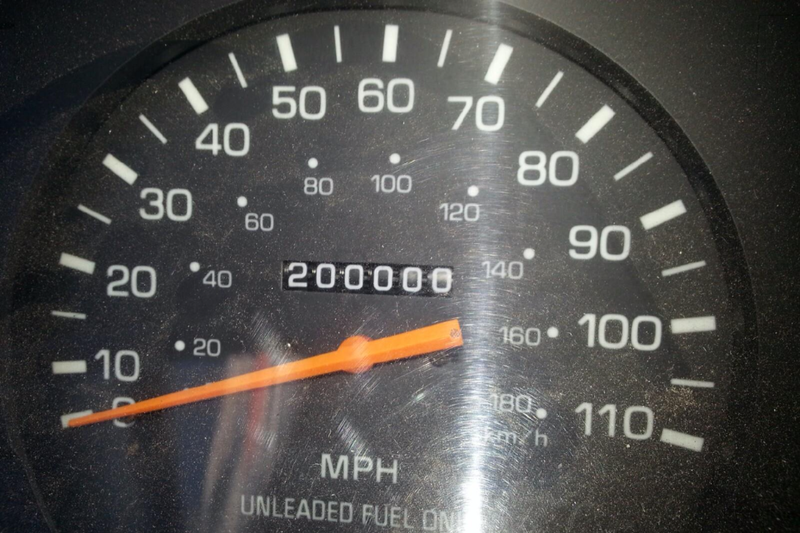 And just a week before, my brother had sent a photo of the odometer as it passed a milestone. Of course, it’s just a machine, a tool for transportation. But have you ever spent so much time with a thing, covered so many miles, seen so much sun and fog and cold rain and darkness, that the thing seems to take on a life of its own? We say that some things that mean a lot to us take on a life of their own. I believe, rather, that they take on our life, simply because our life – our capacity to love – seems to overflow. They are with us so long, or have such a connection to meaning and memory, that they become invested with our emotions. We don’t want to part with them, or throw them in the trash when they lose their shine. They have become Real; more real than a can opener or a DVD player. They have somehow acquired feelings. But not their own feelings, our feelings. Something of our fleeting time – our consciousness of life in the world – is sitting there. Old Blue will not be missed, not really very much, because it fulfilled its purpose, accomplished its task, and did not die young. But we can’t just let such things go unremembered, just walk away without appreciation and not look back, because they have feelings. Of course things have feelings because we have feelings. The universe is consciousness. Everything is aware because everything has the feelings we give away. Everything I touch has feelings. The fact that the truck’s feelings are my own seems less important than the fact that the feelings are Real. Maybe I cast my feelings into the things around me – sparks into the rain – because I’m an introvert and I spend a good deal of time alone with things. So I find consolation in the memories that I find there. Life is memory and memory is fragments. So it goes. We loan our emotions to the world around us, whether the world likes it or not. We make friends with some of the objects in ours lives because we love the memories they represent, the feelings they conjure. And they have been faithful, which is a consolation in solitude. Love is everything. Everything is love. Besides, imagining a long treasured possession as friend is simply fun. Finally, I’m looking at a little copper elephant that roams about my desk, keeping papers in place. He came from a zoo. I got it when I was – I don’t know – a little kid, and our family went to San Diego on vacation. I like my little elephant very much. And there is something you love, isn’t there? You have a teddy bear or a doll, propped up among pillows or resting in a dresser drawer. Or a family heirloom; something from the life of a parent or grandparent, an item which mattered to them. There are people that we love and there are things that we cherish. Perhaps because they connect us to those people, or maybe they connect us with memory. Sometimes the people we love and miss the most are ourselves; we miss our childhood, our innocence, and our peace. We are trying hard to hold on to a world that is rapidly moving on, becoming more tenuous as we grow older. The empathy of suffering things helps, don’t you think? Is it possible, in the time that I have left, for me to become Real? Let Her Go, by Passenger. This entry was posted in Deep Thought, gonzo life by Kyle Kimberlin. Bookmark the permalink. Something I have often thought about myself since I was a small child; perhaps because of The Velveteen Rabbit, a favorite story of mine from those days. I was never able to conceptualize it nearly so well, however, it was merely a vague sense of “what could be.” Thank you for this wonderfully well-written post, it will surely stick with me for weeks to come. This is a fascinating way to look at everyday objects, and it’s absolutely true. We breathe life into the things we love. I like your choice of examples too. 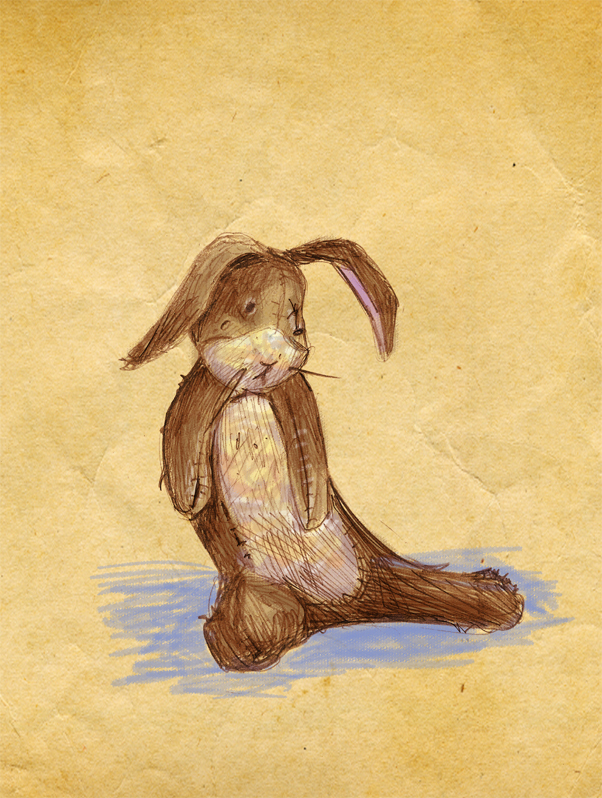 I read The Velveteen Rabbit when I was fairly young and had a security blanket–technically not a blanket, but a stuffed rabbit–myself. Tears were the result. I still have that bunny.